Xplore develops mobile computing solutions dedicated to keeping open mining and underground operations moving, even in adverse and hazardous environments. Whether extracting metal or minerals, Xplore’s C1D2/C1Z2 and ATEX-compliant rugged tablet PCs will help miners effectively plan their day and efficiently carry out mandatory logistical and compliance tasks. While very few desktops, laptops, and handheld mobile PC devices are equipped to survive common environmental hazards, even fewer can endure the uniquely hostile field conditions of the mining sector. Drops and dirt are common occurrences in both open-air and underground mining operations, as are vibrations, shocks, and exposure to potentially corrosive chemicals. Xplore’s fully rugged tablet PCs increase the productivity of mining crews using the company’s tablets to capture and extract essential data in adverse environments and severe climates. Xplore’s rugged mobile computing solutions are tested to MIL-STD-810G standards to prevent severe mobile device malfunctions. The company’s IP65 and IP67 rated tablets prevent harmful water and dust ingress, and I/O ports are sealed on the XSLATE B10 fully rugged tablets to keep real-time data flowing to and from the mining job site without weather-related interruption. Xplore’s rugged tablets always prioritise employee safety and data security, whether they are based on land or at sea. Fine combustible dust found in the air at many mining sites, and chemicals commonly used to help extract minerals can create explosion hazards. The safety of mining workers in such environments goes beyond training and skill; it also includes their equipment. That’s why Xplore implements intrinsic safety techniques applicable to both live-use and tablet failure situations in its ATEX and C1D2/C1Z2-compliant rugged tablets. The Xplore tablets are engineered for use in potentially explosive mining environments, including the Motion F5 by Xplore, the XSLATE B10, and the Xplore XC6. Xplore’s HazLoc-certified tablet PCs boast powerful performance specifications, best-in-class outdoor viewable displays, and a resilient design to keep mobile workers connected, communicating and protected from dangerous data errors and environmental risks. 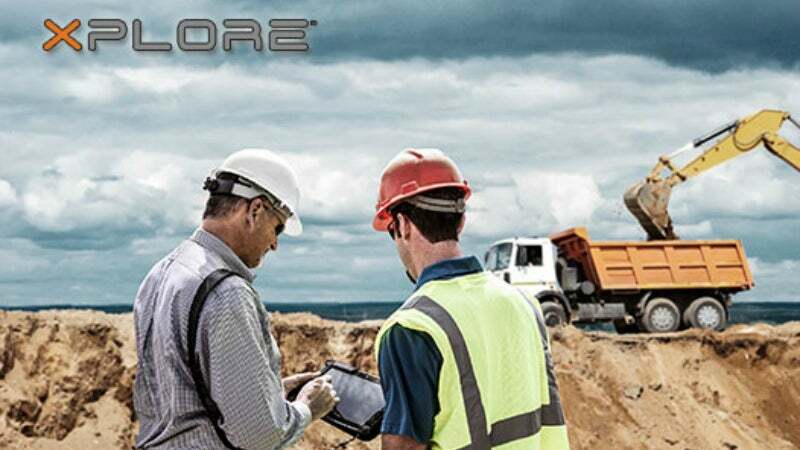 Xplore’s exclusive connectivity tools allow broader utilisation of rugged tablets, and entire mobile solutions, in the office, in vehicles, on heavy machinery, and in the field. The company has an extensive range of weather-proof I/O ports, which are designed to protect data and hard work in severe climates. Standard built-in 4G LTE, Wi-Fi, Bluetooth and satellite GPS technologies also keep clients connected to their data, team and customers in real-time, no matter how remote the job site. Xplore’s hot swappable batteries provide up to 20h of uninterrupted productivity. The outdoor-viewable tablet displays allow for easy data review at any time of day or night, and hi-res cameras, digital pens, barcode scanners, capacitive glove touch capabilities, and companion keyboard options make fast data capture possible in any situation. Xplore’s rugged tablets are an ideal platform to run diagnostic, calibration, and maintenance tools for critical mining applications. The company offers both Windows® and Android™ tablets to accommodate flexible customer software and system requirements, and its products are known for their expansion modules and long lifecycles. Xplore’s tablets also mimic the desktop computing experience in a PC form factor that’s easy to mobilise on foot, mount in a forklift, or dock in a Caterpillar. With an extensive line-up of secure docking / mounting and carrying solutions, mining professionals will have the extended protection, processing power, and connectivity of Xplore’s rugged tablets. Contact us today to see how Xplore’s rugged tablet PCs can be utilised to mobilise every one of your Mining workflows on foot, in a vehicle, or in the office. Xplore Technologies has announced that one of the nation's top ten electric power and natural gas utility companies has placed a $1.7 million follow-on order for XSLATE B10 fully rugged tablets, bringing the customer's total investment in Xplore solutions to more than $2.7 million in 2016. Consumer and commercial-grade products are built to be used under the most benign of conditions. Some computers are defined as semi-rugged or built to withstand coffee spills and some drops. But how can one determine if a computer is 'fully rugged,' that is, able to operate under the harsh conditions they will encounter if utilized for extreme jobs and outdoor areas? When your job keeps you on your feet, you need a durable mobile computer that will perform wherever you need it to go. The F5m rugged mobile computing series delivers high-end, lasting processing power in an ergonomic and ruggedised package. As one of the toughest rugged tablets on the market, the Xplore XC6 series stands out in terms of performance, features, durability, and resiliency. Built with unfailing protection in mind, the IP65 and MIL-STD-810G rated XSLATE B10 rugged tablet endures even the most extreme work environments. It doesn't compromise critical PC capabilities, despite being only 2.4lbs. Built with unfailing protection in mind, the IP65 and MIL-STD-810G rated XSLATE B10 rugged tablet endures even the most extreme work environments. Motion Computing designed an integrated solution to provide field workers with immediate connectivity and accessibility to their tools and information. Around 240 Motion Computing F5 Platform units were purchased in late 2012, with ongoing acquisition. Xplore Technologies, a global leader in rugged computing, today reported results for its fiscal 2017 second quarter, ending 30 September 2016. Xplore Technologies has announced that Strategic Robotic Systems (SRS) has exclusively selected the Xplore XSLATE D10 Rugged Tablet to serve as the core of the intuitive Human Machine Interface (HMI) that will be used to control its new FUSION underwater vehicle. Xplore Technologies has announced that it has received a purchase from one of the nation's largest telecommunications service providers. According to a recent IDC study, widespread interest in detachable tablets is increasing, mainly due to their productivity-centric design and that they can easily transform into a notebook or desktop replacement when the accompanying keyboard is deployed. Xplore, the manufacturer of the world's broadest range of high-quality rugged tablet computers, today launched the XSLATE R12, a next generation detachable rugged tablet PC. Xplore Technologies has announced it has secured an order for its Motion by Xplore C5m rugged tablet computers from one of Western Australia's leading aged-care providers, the Royal Australian Air Force Association (RAAFA). Xplore Technologies has announced a $1.1 million follow-on order for customised XC6 M2 tablet computers. Around 20 years ago, Xplore recognised a distinct demand for ruggedised computers emerging. Xplore Technologies has announced that one of the largest family-known department stores in the United States is deploying an additional $100,000 of Motion by Xplore F5m rugged tablet PCs within its logistics and operations division. Xplore Technologies has marked the beginning of its 20 year anniversary celebration. Xplore Technologies Corp (NASDAQ: XPLR), today launched globally the XSLATE B10, the industry's most fully featured, fully rugged tablet computer to date. Xplore Technologies Corp (NASDAQ: XPLR), manufacturer of the world's broadest range of high-quality rugged tablet computers, today launched the XSLATE D10.